Delayed easyJet passengers at Geneva Airport last weekend were given the chance to escape the usual frustrations thanks to the power of music. 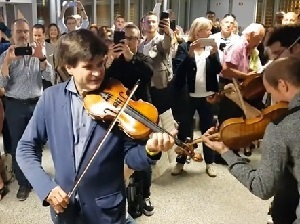 Members of the Camerata of Léman orchestra, accompanied by violin virtuoso Fabrizio von Arx, filled in the time by retrieving their instruments and treating everyone to a rendition of Vivaldi's Four Seasons. Putting a spring in the day, as it were.